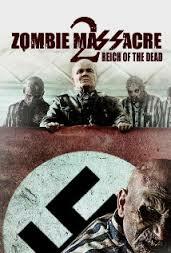 WWII battle worn soldiers come across a Nazi complex where experiments are taking place to resurrect dead prisoners. Zombie Massacre 2: Reich of the Dead (2015) is dark, gloomy and more serious than 2011’s entertaining ride Eaters and more sombre and grounded than Zombie Massacre a.k.a Apocalypse Z. Again filmmaker talents Luca Boni and Marco Ristori deliver a grim competently constructed bleak zombie horror that is stylishly shot with some good blood and gore effects presented on a saturated colour palette. The practical effects come better off that some of the CGI explosions and splatter. The sets and location look outstanding for the budget. With actors Andrew Harwood Mills, Dan van Husen and Lucy Drive who is stunning as Erin the rest of the cast are on form and give performances as their picked off one by one that far surpass those in the first outing. Zombie Massacre 2 is slower and more dramatic than Boni and Ristori’s previous work, and while the story isn’t the most original there’s plenty of gore, creepy visuals, dead soldiers and vertical white stripes zombies, creepy faces and the like. Boni and Ristori are becoming somewhat cult directors and need a breakout mainstream film but for the moment we have to wait a little longer nevertheless its still agreeable zombie fodder. 22 years after the Isla Nublar incident, brothers Zach and Gray Mitchell go to Jurassic World, a fully functional dinosaur theme park to visit their aunt but things go awry and she enlists the help from an old flame to save her nephews. Do you want to see Spielberg’s Jurassic Park overgrown and in ruins, the original T-Rex, Mr DNA, Dr Wu, Ian’s mug on the front of yet another novel, Richard Hammond’s statute and a fully functional Jurassic World (park)? Then you’ve come to the right place. Director Colin Trevorrow offers state-of-the-art CGI, however, less is more and as visually impressive as it is it looses it’s organic feel. The background CGI of the park it’s self is more awe inspiring than much of the dinosaur set ups. 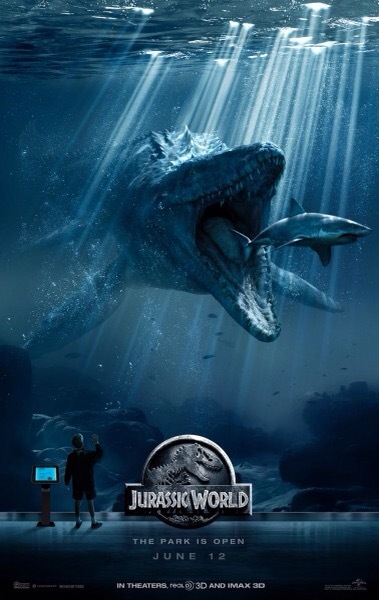 Even with the amazing giant water dinosaur it can’t match the original for impact, but it works in its own right as a good ride and piece of entertainment with some notable stand out moments, including an aviary escape, a velociraptor chase and aquarium killing to name a few. To Trevorrow’s credit it flows from scene to scene rather than in the originals set up to set up, yet due to its pace it’s never spends enough time with its characters for you to really feel for them deep down. Michael Giacchino score and sound design are great complementing the visual effects, especially the climactic fight scene. The film takes a swipe at American war policy, commercialism and the like, however, even with four writers including Rick Jaffa, Amanda Silver, Derek Connolly and Trevorrow the dialogue is not as credible as the previous instalments. There’s plenty of nods to the other films, even a throw away line about why the Jurassic Park and World dinosaurs may not look like the dinosaurs that roamed the earth 65 million years ago cleverly batting off any criticism of the creature designs and any factual inconsistencies. Thankfully there’s no part III annoying screaming and Chris Pratt’s and Bryce Dallas Howard (as Claire Dearing) performances are great. The cast are enjoyable, funny even if a little ridiculous at times. The exploitation military subplot feels a little unnecessary and the dinosaurs are humanised a tad too much robbing World of its fear factor. Louder and bigger doesn’t mean better and it lacks any subtly, but it undeniably entertains. It’s Westworld with dinosaurs with a few moments that even encompass the Jurassic Park novel, a reminder as to why you fell in love with dinosaurs all over again in the first place.